If Pondicherry, in India, is associated with the French, and Goa is associated with the Portuguese, then Tranquebar is connected with which part of the globe? Persons knowledgeable about history would immediately recognize that it is the Danes. Welcome to Tranquebar, a place of tranquility located alongside the Coromandel Coast of southern India which is of undeniable historical importance. Tranquebar or 'Tarangambadi' (the actual Tamil vernacular name) is situated in the Nagapattinam District of the state of Tamilnadu. Among other historical monuments, Tranquebar boasts the famous Danish 'Dansborg Fort.' History has it that King Raghunatha Nayak, ruler of Tranquebar, wanted to expose his kingdom to different trading avenues. Fortuitously, Danish explorers on a sea voyage happened to visit, and upon seeing the serene seashore, thought it an excellent place to trade. The Danes approached King Raghuntha Nayak and a settlement was set aside for trading. The visitors were enthused by the favorable treatment accorded them by the Indian King, and the fruitful relationship was formalized as the Indo-Danish pact during the King's reign. Amazingly enough, 3,111 rupees (~$69) per year was the price that King Nayak received to rent out Tranquebar to the Danish. This amount may look like a pittance in terms of today's land values, but it was the sum that paved the way for a period of co-existence between the two cultures. The agreement document, which was signed by King Nayak in Telugu, is now housed in the international archives at Copenhagen, Denmark. The Danes eventually sold the entire Tranquebar area to the English for a sum of 12, 500,000 rupees (~$276,000). With India's independence in 1947, the fort became a protected monument by the Indian government. The State Archeological department of Tamilnadu maintains the fort, inside which a museum now resides displaying artifacts of both Danish and Indian origin. The fort is now under renovation. The museum has added many interesting articles to its collection, from fossils to Danish articles, Danish coins, Chinese porcelain items, etc. Weapons used by the Danish are in display in the museum, and are of considerable importance to researchers involved in the study of ancient weapons like swords and spears. Paintings of Maratha kings are also available in the museum. Palm leaf manuscripts are on display, which highlight the method of scripting used in days of yore. Some of the documents feature the seal of the Danish governor. Terracota figures and bowls add spice to the list of articles. For example, an urn burial jar is on display, giving some idea as to how people in those days might have utilized such recepticles. A sixteen-point treaty between King Rahunatha Nayak and King Christian IV is on display, and arouses visitors' interest to read its terms and conditions. It is astonishing to note the professionalism with which the treaty was written, in addition to the social and security aspects that it addressed. Danish Navy Captain Roland Clippe was instrumental in striking the deal on behalf of the Danish King with his Indian counterpart, and was also the driving force behind the construction of the Dansborg Fort. Notwithstanding the prominence of the fort, the other monuments and edifices surrounding it also bear testimony to the fact that Tranquebar is certainly worth visiting for historic interest. The Zeigenbalg Monument pays homage to the achievements of Barthlomeus Zeigenbalg, and Plutschau of Germany. 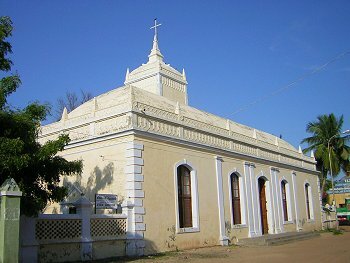 They landed at Tranquebar on 09.07.1906 on the orders of Danish King Frederick IV to provide religious services and public service in India. They evinced an extraordinary interest towards learning the Tamil language, which took Zeigenbalg two years to master. He translated a Tamil book titled "Ulaga Needhi" (Universal Justice) into German, which is now available in the government library at Copenhagen. An international exhibition at London hosts another of his great works titled, "An account of the Malabarians." Not many may be aware that Zeigenbalg set up the first printing press in India at Tranquebar. The press was utilized to print the first Tamil version of the Holy Bible (New Testament) in 1715 AD. He now rests in peace in the New Jerusalem Church, an attractive Danish building built in 1718. The familial relationship between Tranquebar and Denmark still continues to flourish, nurturing the historical ties. The Princess of Denmark visited the Dansborg Fort a few years ago and reminisced about its history, stating that she was happy to see that the it was being renovated. The Tranquebar Association at Denmark was responsible for the partial renovation of the fort in 2002. The Archeological Survey of India and the State Tamilnadu Archeological department also supported the construction. Tranquebar is also environmentally healthy in that it is considered an 'Ozone Rich Beach' due to the presence of profuse amounts of ozone. Ozone that contains three molecules of oxygen acts as a deterrent to harmful ultraviolet rays from penetrating into the atmosphere. Ozone therapy is becoming popular nowadays as a non-invasive procedure in treating heart ailments and cancers by injecting ozone into the body. The fort, which is in an ideal location, can be reached from Karaikal, the nearby Union Territory or from Kumbakonam by bus. It's about 35kms north of Nagapattinam and 50kms form Chidambaram. The ancient port city of Poompuhar nearby Tranquebar is also worth a visit. History lovers can definitely find lots of interesting information in the fort and would certainly be amazed to see how it withstood the fury of the Tsunami waves, which shook the coastal areas of Tamilnadu. Even as the tides wait for no one, the fort continues to stand as a grand momement to the area's past, waiting to attract more tourists who wish to learn more about a history that embraced both trade and culture. View the Worldpress Desk’s profile for CSVR Murthy.